Porsche achieved 19 total vicotries at the 24h of Le Mans since 1970 and wrote motorsports history. In the Formula 1, the people from Stuttgart had not been very successful with the Porsche 804: The factory team achieved two vicotries and some points, not more. With the money from the sponsor Techniques d'Avant Garde or shortly called TAG, McLaren Racing Ltd. managed to order an engine for the Formula 1 at Porsche. Under the designation TAG Porsche, this power source, developed by Hans Mezger, won the respective world championship in the years 1984, 1985 and 1986. Insofar, these modelcars are dedicated to the topic Porsche and belong to the McLaren MP4/2B of the team Marlboro McLaren International in the legendary white-red painting, which are limited to 700 pieces and should be included in every collectors showcase. Matching to the race car of Alain Prost (530851802) from 1985, the McLaren MP4/2C of the following year, arrived as well; also limited to 700 or 250 units and in the colores of the driven cars by Prost and Keke Rosberg, under the item number 530861801 and 530861802. The miniatures are from the factory of Minichamps. 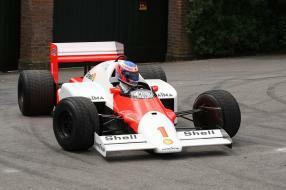 In 1985 and after a superior season, Alain Prost raced with the car, which had been built by the british engineer John Barnard, to the top of the chart. 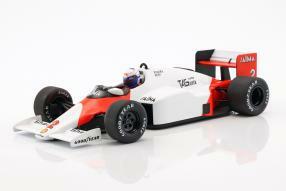 Then in 1986 the team was not as superior as the year before. But it will always stay in our memory that Alain Prost had been rolled out 100 meters before the finifsh line without any fuel at the German GP, which was caused by the reduction of the fuel tanks of about 25 liters less volume of fuel. Ultimately, he had been counted as sixth because of the driven distance, even without crossing the finish line. 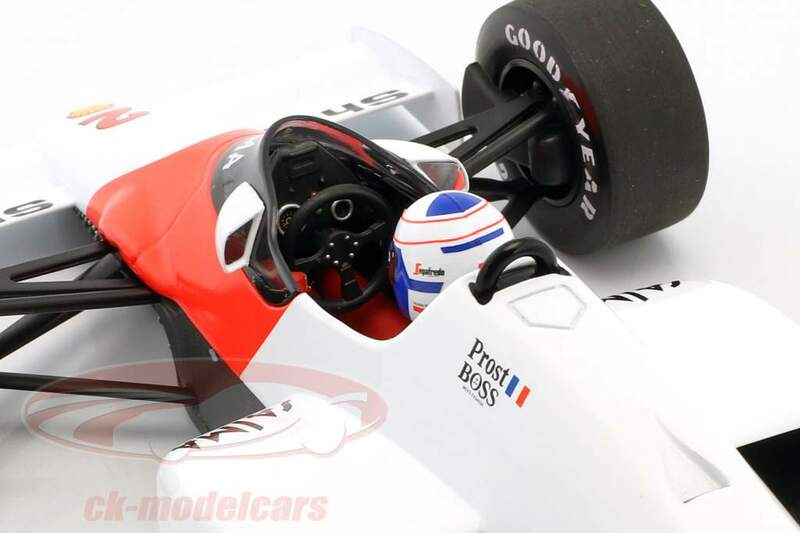 The modelcars are produced out of diecast and offer the purchasers steerable front wheels as well as a driver figure, which sits in the faithfully recreated cockpit. You can not see very much from the six cylinder turbo engine with its 1,5 liters of capacity. The engine of the 1986 McLaren MP4/2C had provided about 590 kW / 800 PS to the rear wheels and was shifted by a five speed transmission. What we really appreciate, is that the race cars of the time had been so unspoilt, like without the many wings and plates from nowadays. The stickers with the name of the cigarette brand are of course attached to the harmonious modelcars.